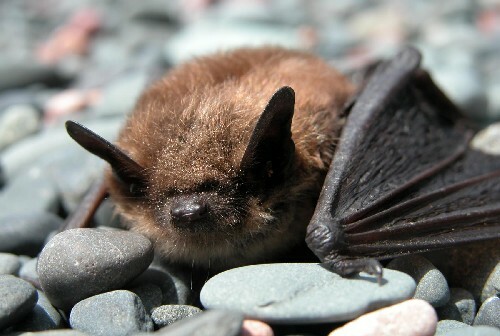 On October 8-10th of 2008, wildlife pathologist Dr. Scott McBurney and technician Darlene Weeks volunteered with the New Brunswick Department of Health on their Wildlife Rabies Control Program. Rabies is an infectious and fatal disease of the central nervous system that affects mammals. Raccoon rabies is a strain of rabies that is spread mainly by raccoons, but also affects skunks. The raccoon strain (mid-Atlantic) was first discovered in a skunk near the town of St. Stephen, NB in September 2000. Vaccination is one way to control rabies in wildlife. Animals vaccinated against rabies will act as a buffer, slowing and stopping the spread of the disease. Wildlife rabies control has prevented the spread of raccoon rabies (2001 to 2002) in NB. Wildlife rabies control has also eliminated raccoon rabies from NB and has prevented further introductions (2003 to 2007). In late August 2008, an Oral Rabies Vaccination (ORV) Program was conducted in the St. Stephen to Woodstock area in response to cases in Maine. In rural areas, baits were distributed by airplanes flying about 200 meters above the ground. In urban areas, baits were distributed by hand. When the bait and vaccine is eaten by raccoons and skunks, the animal becomes immunized against rabies. 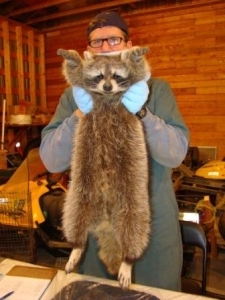 In early October, trappers live trapped and released raccoons and skunks in 10 km square areas within the ORV zone, to evaluate how many raccoons had had access to the vaccine and how they were responding to it. Scott and Darlene participated in the monitoring process of this program in the Woodstock area. They aided in the care of the animals while under sedation, administering of medication, taking of blood samples, tooth extraction and data recording. Decline of the George River Caribou Herd.